We had an idea of driving around the famous Ring Road of Iceland somewhere in October 2013. Driving this major road in winter is sometimes considered almost impossible. Maybe that’s why we wanted to try to do this Iceland Ring Road tour in only 11 days. We did careful planning for this trip already months beforehand with checking the conditions, as well as choosing and booking the accommodations from possible distances apart. We also tried to take notice of all the possible delays what the ever changing winter weather could bring before us. As you know, in Iceland there can be winter storms, snowfalls, harsh winds, and sandstorms along the way, just to mention few. We also have only 11 days to complete the whole thing – which is not much! So we will need a bit of luck with us, too. Or maybe a whole lot of luck. As writing this, we have already driven successfully from Reykjavik all the way through the famous Golden Circle, the famous black sand beach in Vik, Eyjafjallajökull volcano and glacier, Vatnajökull glacier, and Skaftafell National Park to have a two nights rest here in Hali. On the day when we arrived in Reykjavik on the 23rd of December, the Icelandic Road Administrations website showed that the road to Vik and forward was marked in red. The red means “impassable.” There were also yellow circles with red linings which mean “No passage.” Because of this information we were really worried that we wouldn’t be able to even start our winter road trip adventure. But after we had spent our two nights in Reykjavik and when we had begun off to our journey, the roads had all turned into yellow and green on the website! And those colors mean just “spots of ice” and “easily passable.” In this country, that means that the roads are in good condition. So we were more than happy. This change had also happened just in overnights’ time! I think that the Icelandic Road Administration takes good care of the highway one (aka the Ring Road). It’s the whole country’s main road after all. So we took off. 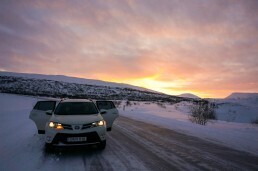 Just about 15-20 kilometers (a rough estimate) after driving out of Reykjavik, there were already some impressive views in front of our eyes – mountains and a gorgeous sunrise from the middle of nowhere! 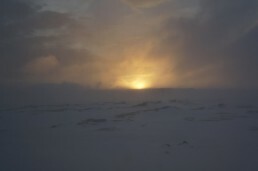 A sun rising from behind the horizon in Southern Iceland. We have already checked out the sights of the Golden Circle. The best of them was the Gullfoss waterfall, where some of the “The Wall” -scenes from the successful TV-series, Game Of Thrones, have been filmed. That place looked absolutely majestic. The Geysir, on the other hand, was a bit of a disappointment, it being pretty small and not functioning much anymore. Then again, its “little sister”, Strókkur, erupts every 10-15 minutes. So if you want a picture of a geyser erupting with a statue of steam and water, just wait with your camera ready, and you’ll get it at Strókkur. I’ll later write more about Iceland and all these sights. This is only an “On the Road” -kind of a post. That’s why I’m just writing briefly about some highlights that we have been seeing and doing so far. Last night we stayed in a country hotel in Lambafell. It was a log-style built house at the root of a mountain. Reminded me little of the hotel seen in Twin Peaks, actually. In the morning we continued our journey from Lambafell to the famous black sand beach of Vik to take some magnificent pictures. Lambafell was located conveniently via our route over to the Skaftafell National Park Visitors Centre, where we had booked a glacier walk at the Svínafellsjökull glacier. 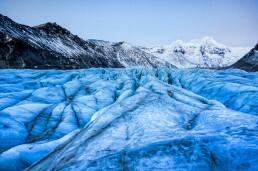 It’s an outlet glacier of the massive and most famous glacier in Iceland, the mighty Vatnajökull. We had booked our tour with Mountainguides tour company. This glacier walk was the best experience we’ve had here in Iceland so far! We saw absolutely magnificent views, blue ice, and mountain ranges. 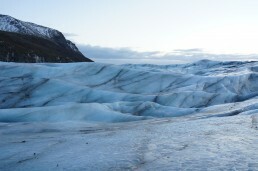 And the farther you walked on the glacier, the more beautiful it got. We also had an excellent guide, Dana. She told us much information about the glacier and took really good care of us through the whole tour. Her devotion showed that she really loved her job, and she even gave us a longer tour than we had originally booked! Our group was just 6 people altogether (only two individuals who were not part of our own party), so this was a great deal. Piritta on a glacier walk at Svínafellsjökull glacier tongue in Iceland. When we asked our guide, Dana, about how many tourists had died here on the glaciers over the years, she told us about a few people she had rescued. After hearing her stories, I just have to say that some people really are crazy! Arrogance and overestimating your own skills can be a really deadly mix. When you’re in an environment which you’re not familiar with, you should be really careful and most important of all – don’t go alone! Instead, always go with a local guide! We’ve now had a one days’ layover here at Hali Country Hotel and today we drove the short way to see the famous Jökusárlón glacier lagoon. They do zodiac boat tours on the lagoon but at the moment they are all canceled. At the time when we arrived at the lagoon, we also understood why. Jökulsárlón is now completely full of those big chunks of ice and little icebergs. There wouldn’t have been space for even a small zodiac boat to sail. 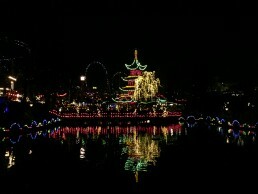 The scenery at the lagoon is actually really surreal now. Below are some pictures that we took. Look for yourself. 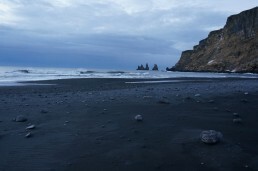 The black sand beach of Vik and Raynarsdjangar (troll fingers) in Iceland. 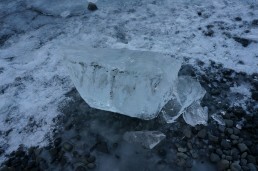 A block of ice at the Jökulsarlon glacier lagoon in Iceland. From here we’re going to continue our winter Ring Road adventure all the way up the Eastern side of Iceland to the city called Seydisfjördur. It’s a port town on the lap of a fjord. At least that’s our original plan. But if something happens on the way or if we have to take a detour, etc., then we can also change our plans and spend the next night somewhere else instead. Hopefully, the luck will continue to be on our side, and the road conditions continue to be OK. So keep your fingers crossed! Iceland truly is a magical place, and I hope that the next time that I’ll be writing, it’ll be from the northern Iceland. We have planned to spend the New Year in Akureyri. So stay in touch to read some more Road Posts from this Ring Road of Iceland adventure! The best gift guides for the adventure travelers in your life! Join into the second part of our epic Road trip around the magical Iceland at winter!! 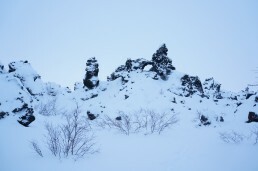 Take an inside peek in Dimmuborgir (the Dark Castle), Mývatn Nature Baths and much more.